Atlanta From the Ashes is locally known as The Phoenix. 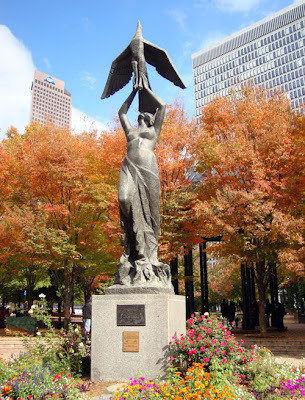 The mythical Egyptian bird, the Phoenix, has long been the (unofficial) symbol of Atlanta. It too rose from the ashes. The 21-foot bronze statue, commissioned by The Rich Foundation for the 100th anniversary for its downtown department store, was moved to Woodruff Park in downtown Atlanta for the 1996 Summer Olympics. Coincidentally, the pink granite building in the background (left) is the Georgia Pacific Tower, which stands where the Loew's Grand Theatre once stood, the theatre where Gone With the Wind premiered. Gone With the Wind was set during the American Civil War when Atlanta was basically burned to the ground...burned to the ashes from whence she rose. You may have noticed that I also chose the Phoenix for the tourATLANTA logo. This blog has in large part been a means through which to rebuild my relationship with Atlanta and her citizens. And that I get to share my experiences with readers around the world and hopefully encourage many of you to step out and explore the city is a great reward for me.